This recipe is an adventurous yet simple take on a hearty stew! It features goat meat and a very popular Malian condiment called soumbala, which is a fermented bean paste. 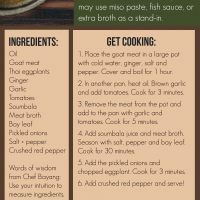 Soumbala can be found in some local African markets or you can substitute miso paste, fish sauce or extra broth. Enjoy!